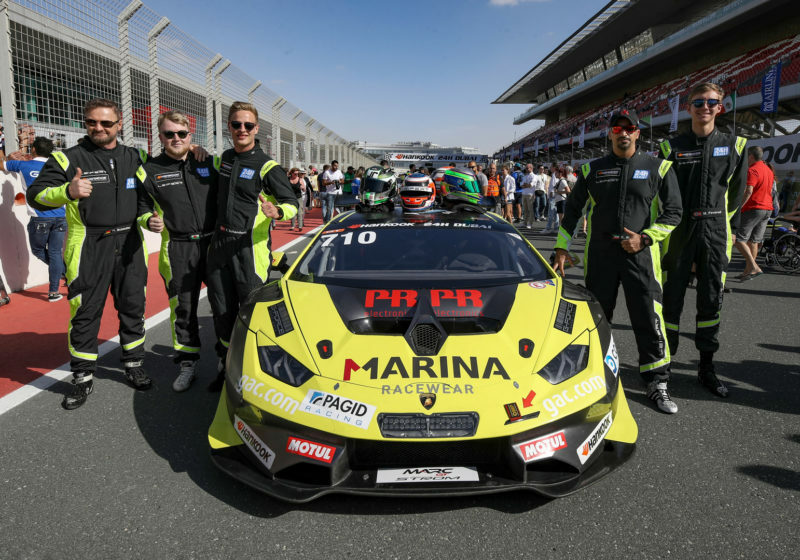 Khaled Al Mudhaf, Kuwait’s most experienced racing driver, with the countries historic first ever licence #0001, took a well deserved victory with with the Lamborghini Hurican Super Trofeo EVO. 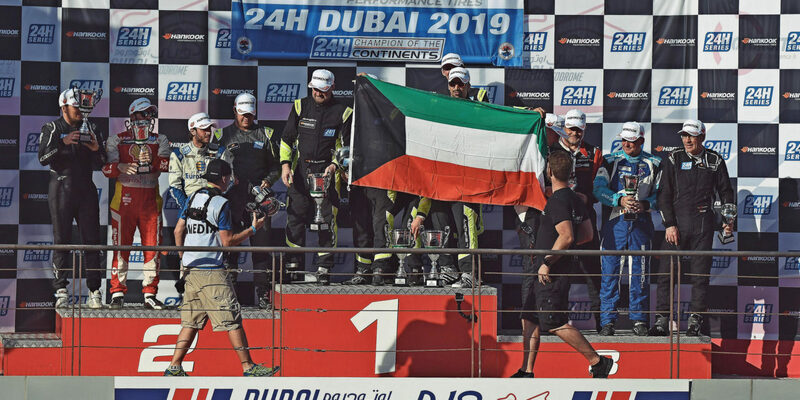 Over 280 drivers from 33 different nationalities and 80 cars took part in the Dubai 24H motor race this past weekend at Dubai Autodrome Circuit. Starting the race 18th position in the SPX category, (Specials) the Leipert Motorsport team from Germany had a clear strategy, to use their drivers to the maximum in a bid to take home the winners trophy, and the team did exactly that. The team scored an overall position of fourteenth amongst all the other classes of cars. Four other drivers made up the team this year joining the Kuwait racing hero, Frederik Schandorff (Denmark), Harald Schlotter (Germany), Marcus Paverud (Norway), Jake Rattenbury (Wales), all of whom drove faultlessly taking it in turns to drive for the 24hour duration. In a race that lasted for a full 24Hours, from Friday 3pm till Saturday 3pm, incredibly the total race distance covered by the drivers in the 24 hours is equivalent to more kilometers than a Formula 1 driver races in a full season. Additionally the team achieved a remarkable second quickest total pit time in the entire 24h race, only beaten by the Scuderia Praha Ferrari 488 team who made a total pit time of 1:23.13, (29 pits stops) and Leipert had a time of 1:24.56, (22pit stops), impressive considering the cars would stop for both tyres and fuel on every pit stop. The Lamborghini with its impressive V10, 610HP 5.22lt capacity also showed its best side and ran like clockwork. During the first quarter of the race it became exciting at the front: Again and again there was a new class leader. 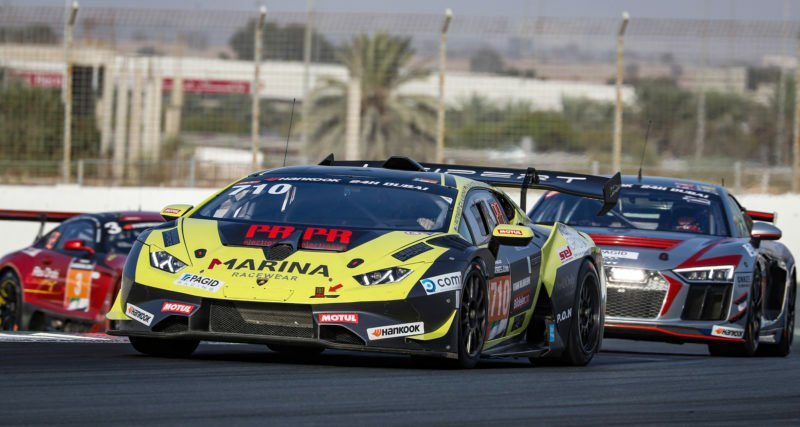 At the latest after the fifth hour of the race it was clear that there was no getting past the Leipert Motorsport Lamborghini #710. The driver quintet confidently defended their first position. The driver changes went without problems and both – car and driver – came through the race without any issues. When the chequered flag was waved at the end of the 24 hours, Harald Schlotter crossed the finish line as the final driver, five laps ahead of the runner-up. “Im so proud to receive this top special winners trophy for my home country of Kuwait, it’s a very special race here in the Middle East region and one of the biggest races in the world,” commented Khaled Al Mudhaf. Khaled has won the Dubai 24H race before in 2014 with Ferrari, and was inducted into their prestigious Ferrari ‘Hall of Fame’ in Italy for his success, a first for Kuwait and Arab history in Motorsports. Khaled has been carving out a successful racing career since the age of eleven years old, starting out in the deserts of Kuwait in motocross. Khaled owns his own Kuwait based Racing Team called GForce since 2010. He became a young Kuwait MotoX Champion at age fourteen and now has progressed to the highest level of competition in circuit racing today with some of the worlds leading brands such as Ferrari, McLaren, Porsche and Lamborghini, competing alongside the worlds most experienced drivers.